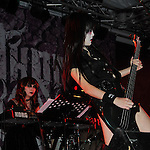 This gallery contains images shot at a ChthoniC concert in Kaohsiung, Taiwan, on Boxing Day, 2010. ChthoniC is a Black Metal band from Taiwan. Current band members include lead singer Freddy Lim, aka Left Face of Maradou, hot bassist Doris 'Thunder Tears' Yeh, guitarist Jesse 'The Infernal' Liu, drummer Dani 'Azathothian Hands' Wang, and CJ 'Dispersed Fingers' Kao on keyboards/synthesizer. The band is known for their shocking and original stage costumes, which are composed mainly of corpse paint: Freddy often wears face paint resembling the mark of a damned spirit. Doris paints herself to look like a goddess of death. Jesse has curses written all over his face. The bottom half of Dani's face is often covered in a black demon mask, and CJ often wraps a cloth around his head, which, in mythology is a spell to raise Chinese vampires. ChthoniC has performed at many internationally renowned musical festivals in Asia, North America and Europe, e.g., the Fuji Rock Festival in Japan, the Ozzfest in the USA, and the Wacken Open Air music festival in Germany. ChthoniC's outstanding achievements in more than a decade have made it a star among Asian metal bands in the eyes of North American and European rockers. While some of ChthoniC's songs have their lyrics partly or entirely written in Taiwanese, Japanese, English, or Taiwanese aboriginal languages, most of the band's lyrics are written entirely in classical Chinese, which is rarely seen in contemporary Chinese music. The band blend classical Chinese string instruments with present-day Heavy Metal to achieve their own, unique sound in what is sometimes dubbed Oriental Metal. The themes of ChthoniC's songs mostly surround the defiant spirit of early Taiwanese colonizers, fictional wars between aboriginal gods with Han Chinese gods, Taiwanese folklore and mythology, and the historical event known as the Wushe Incident, which was a rebellion against the Japanese governor by the Seediq people.